There is more information available on this subject at Telesto (moon) on the English Wikipedia. This article is about the Saturnian moon. For the gun, see Telesto. 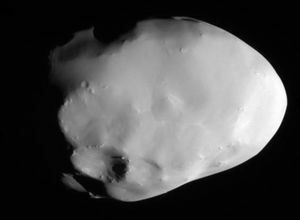 Telesto (also known as Saturn XIII and Tethys B) is the thirteenth moon of Saturn. Following the Battle of Saturn a cloud of material from one of the Queen's Harbingers was detected surrounding it, which was later used to create the Exotic Fusion rifle that bears its name. Telesto is named after the ancient Greek sea goddess and daughter of the Titans Oceanus and Tethys. As the personification of divine blessing or success, ancient Greek sailors would make offerings in her name to ensure a safe and successful voyage. Telesto co-orbits with Tethys, occupying its leading (L4) Lagrange point.